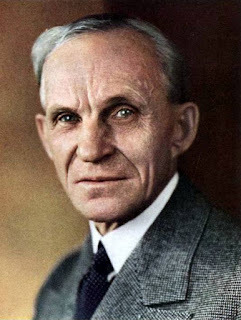 Henry Ford, industrialist and antisemite. [Lyons] talks of “a long tradition in Nazism and other parts of the far right of drawing a distinction between finance capital and industrial capital”, with the former, identified with Jews, being seen as “parasitic”. Sakai argues that fascism radically reshapes the capitalist social order to create an economy of “heightened parasitism”: “a lumpen-capitalist economy more focused on criminality, war, looting and enslavement.” He describes how Hitler’s regime elevated millions of German workers into a new parasitic class of soldiers, policemen, and bureaucrats and replaced them with a new proletariat of foreign and slave laborers, retirees, and women. This process “created an Aryan society that had never existed before” -– giving Nazi racial categories a concrete, social reality that was qualitatively new (but which paralleled the color-line divisions of U.S. society). Sakai’s discussion belies claims that Hitler’s regime had little or no impact on the socioeconomic order. We should remember, however, that this discussion does not apply to Italian Fascism, which lacked Nazism’s overarching racialist imperative and never consolidated the same degree of control over the state. Its effect on the socioeconomic order was far more limited. Hamerquist takes fascist anti-capitalism more seriously than Sakai does. He notes that current-day fascist movements encompass various positions on how to relate to the capitalist class, from opportunists who want to cut a deal, to pro-capitalist revolutionaries who want to pressure big business into accepting fascist rule, to some third positionists who want to overthrow the economic ruling class entirely. It is unclear how serious a challenge to capitalist economic power any fascists would mount in practice. Where it has been tested, fascist anti-capitalism has meant opposition to “bourgeois values,” specific policies, or a “parasitic” wing of capital (such as Jewish bankers) -– not the capitalist system. On the other hand, as Hamerquist warns, it would be dangerous for leftists to dismiss the prospect of a militantly anti-capitalist fascism simply because it doesn’t fit our preconceptions. Hamerquist’s concept of fascist anti-capitalism rests partly on his analysis (following German left communist Alfred Sohn-Rethel) that German Nazism foreshadowed “a new ‘transcapitalist’ exploitative social order.” In particular, Hamerquist argues, German fascism’s genocidal labor policy broke with capitalist principles. Not just labor power, but workers themselves were “consumed in the process of production just like raw materials and fixed capital,” thus obliterating “the distinctively capitalist difference between labor and other factors of production.” True, “normal” capitalist development involves genocide “against pre-capitalist populations and against the social formations that obstruct the creation of a modern working class.” But by contrast, “the German policy was the genocidal obliteration of already developed sections of the European working classes” –- i.e., the importation of colonial-style mass killing into Europe’s industrial heartland. This doesn’t necessarily mean that Nazism was in the process of overthrowing the capitalist system. The labor policies Hamerquist describes did not call into question the economic power of big business, and arguably could not be sustained for more than a brief period. But the very fact that they were not sustainable may be part of the point. As Hamerquist reminds us, Marx warned that the contradictions of capitalism might end, not in socialist revolution, but in “barbarism,” “the common ruin of the contending classes.” Fascist revolution could be one version of this scenario. Photo credit: Jeffrey White Studios, Inc. - Time Magazine (public domain), courtesy of Wikimedia Commons. An Alt Right Update - Six Months After "Ctrl-Alt-Delete"
5. Alt Rightists and their allies have been turning toward physical violence and creating a street-fighting presence. "At the same time, we shouldn’t exaggerate either the unity or the competence of this new wave of militant right-wing forces. Rightists are just as vulnerable as leftists to infighting, personality conflicts, and sectarian ideological squabbles.... So far, thankfully, their movement has failed to produce a skilled, charismatic leader who can unify them and provide strategic direction.... And even a strong leader wouldn’t necessarily overcome the basic political differences separating Alt Rightists from their conservative fellow travelers. In the long run, if the Alt Right wants to coalesce with system-loyal rightists, it either has to win more people to its dream of right-wing revolution, or abandon it." 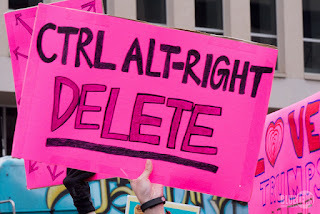 The report "Ctrl-Alt-Delete" is also the lead essay in the book Ctrl-Alt-Delete: An Antifascist Report on the Alternative Right (Montreal: Kersplebedeb Publishing, 2017). Photo credit: Mark Dixon, via Flickr Commons (CC BY 2.0).